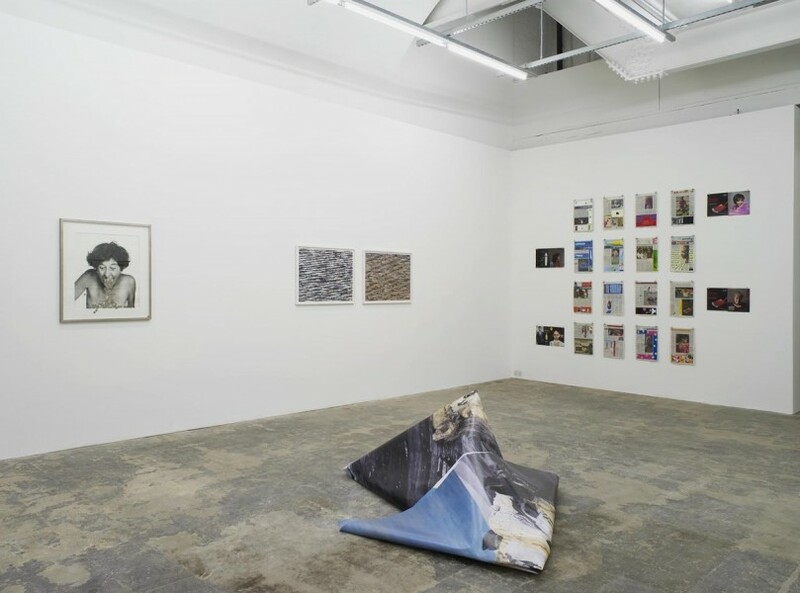 This is very much a last-chance-to-see call to action as the current show at Hollybush Gardens closes tomorrow, in advance of Johanna Billing | PULHEIM JAM SESSION opening next Thursday. But the weather is set fair for the weekend and Saturday is just the day for a delicious lunch around historic Clerkenwell Green and a stroll down to Warner Yard. For this show the gallery has assembled work by artists some of whose careers span almost half a century, others who have only gained prominence in the last five years. Typical of the probing, thoughtful curating at Hollybush Gardens, the works all either arise directly from the conceptual art of the 1960s or respond to it. Esther Ferrer, for example, is one of the first generation performance artists who, alongside more well-known figures now such as Marina Abramović, pioneered work in the 60s that took the body as the central motif. Ferrer represented Spain at the 1999 Venice Biennale and is widely regarded as one of the major figures of her generation. Forty-odd years later, unselfconsciously accepting the ageing of her own body, she continues to make work that comments trenchantly on the world and our place in it. Ferrer’s works in the current show are self-portraits collaged with coins spilling out of her open mouth. Fantastically arresting images, they have both concision and urgency as a comment on our capitalist/consumerist society. 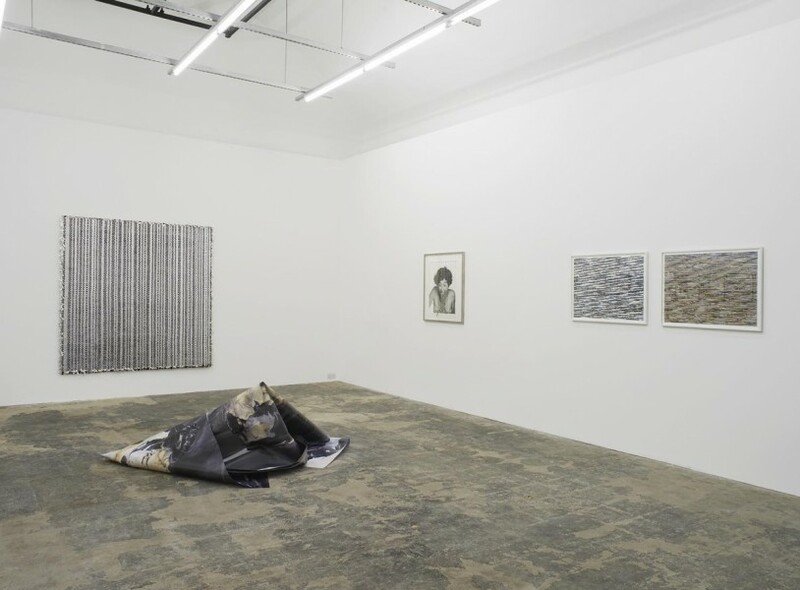 Eline McGeorge is a young Norwegian artist whose series of works using space blankets embodies a commentary on the unequal position of female artists in her native Oslo. Literally using materials associated with emergency: the silver space blanket is rendered in to strips and woven back and forth with black rubber, to represent the underrepresentation of female artists in museum collections and commercial galleries. The use of a craft technique often associated with female practitioners is deliberate here, but also sets up an interesting resonance with the work on the other side of the gallery by Joachim Schmid. Schmid takes found photographic materials and runs them through a shredding machine before reconstituting them as new images. Period magazine spreads, even when subjected to such a violent deconstruction, still betray recognisable traits of colour and graphic identity; text-based works evince the closest comparison to woven textiles, while meaning is scrambled through a cut-up technique more comprehensive than anything imagined by William Burroughs. Sunil Gupta began making photographic work in the 1970s. Centering on the depiction of the gay community, the most intriguing work here is a fragment of a piece he made originally in 1980. It is a slide show portrait of the legendary London Lesbian and Gay Switchboard organisation that was founded in 1974, just before the community was devastated by HIV/AIDS. The accompanying framed works from the same period, staged portraits of gay men in the city, were made in direct response to the notorious Section 28 with which Margaret Thatcher’s government tried to suppress the depiction of non-heterosexual relationships. While Gupta’s work might lead us to consider the ground gained in terms of our prevailing social attitudes, Lubaina Himid’s Negative Positives: The Guardian Archive (2007-2015) allows no room for neo-liberal complacency. 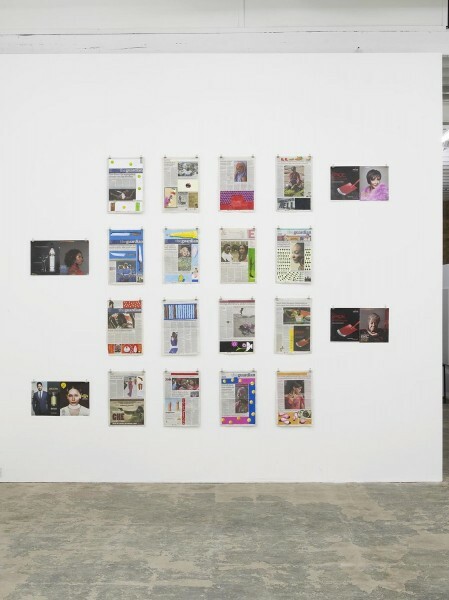 In an ongoing project based on the broadsheet newspaper we consider perhaps the most enlightened, Himid highlights the staggering pattern of insensitive editorial decisions in the presentation of black women, while asserting her own voice through painting panels over the top of the newspaper sheets, taking motifs from elements of dress or other details from the outstanding athletes, performers or other celebrities depicted. There is unfortunately no room here for me to write at length about all of the artists in this fascinating show. This is a rare chance to see work by some artists who are too infrequently shown here in London, in a context that weaves useful connections between generations. Go Go Go.